Unlike total variable costs, total fixed costs remain the same regardless of changes in activity. For example, a factory may need to pay a fixed amount of property taxes and supervisor salaries regardless of how many units it actually produces. You don’t connect any cost driver with fixed costs because these costs don’t change. When you graph costs on activity level, sketch fixed costs as a straight horizontal line. Here you can see an entertainment company that produces and sells music videos online. No matter what the activity level — 80,000 or 120,000 downloads — the company must still pay the same amount for salaries and utilities: $100,000. On the other hand, fixed cost per unit does decrease with volume. The more units you make, the lower the fixed cost per unit. 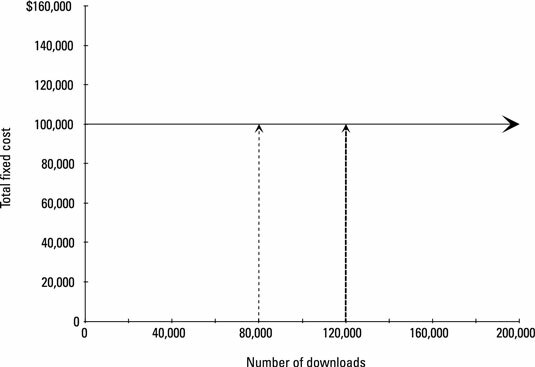 The following figure illustrates this relationship. If your music video download company sells only 20,000 downloads, the fixed costs of one download equal $5 ($100,000 total fixed cost ÷ 20,000 units). However, if the company sells 200,000 units, the fixed cost per unit drops to $0.50 ($100,000 total fixed cost ÷ 200,000 units). 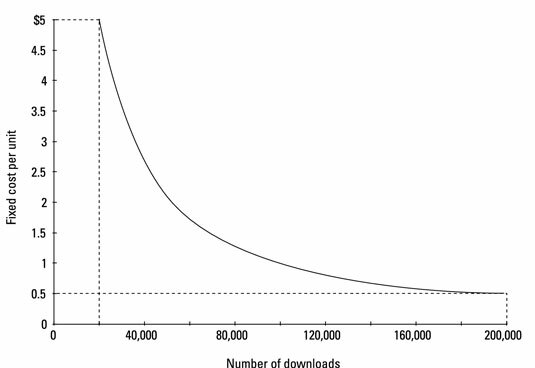 If the company sells only one download, the fixed costs for that one download equal $100,000! High fixed costs require significant activity to produce sales to offset those costs. In other words, if your company must pay $100,000 in fixed costs, it needs to sell enough products to cover this cost.